In today’s world of social media, there’s really only two powerhouses—Facebook and Twitter. And those of you with Twitter accounts know the power of a Tweet. Getting more followers means reaching more people, but the vast majority of Tweeters are following only a handful of Twitterers themselves. Do you ever wonder why them? What’s so special about these selected followed users? Is it worth it to follow them, too? That’s up to you, but if you’re searching for more people to follow, then it’s simple. You can follow those who follow you, or you can find Twitter users with like interests, or people you admire, and browse their following list, looking for those special Tweeters who stand out. But that can be a painstakingly long process. There’s a Twitter-friendly website called TwtRoulette that allows you to become someone else, so to speak. The site allows you to peruse another person’s Twitter timeline, exactly how they see it. In Twitter, when viewing someone’s profile, you’ll pretty much only see what that person is Tweeting about. You can see who they’re following, but you can’t see the whole deal—what those people are Tweeting about. But TwtRoulette lets you become a Twitter spy, providing you with the secrets to social media espionage. You can see everything through the eyes of the beholder, seeing every Tweet from all of those they follow. It’s a great way to find like-minded individuals to follow yourself… or for just pure enjoyment. It’s also helpful in job interviews—just imagine how helpful it could be to get inside the head of your potential boss—you can find similar interests and use them to your advantage! There’s one catch— there’s only a small number of Twitter users you can browse. It’s an opt-in service, meaning Tweeters need to add themselves to the list, and right now there’s only a handful (roughly 200). 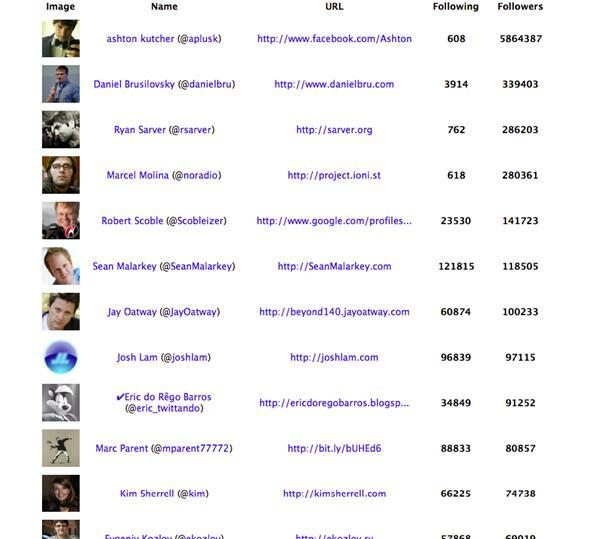 To test drive the service, go to their website and check out the selected power users (ones with the most followers) who have opted in to TwtRoulette. 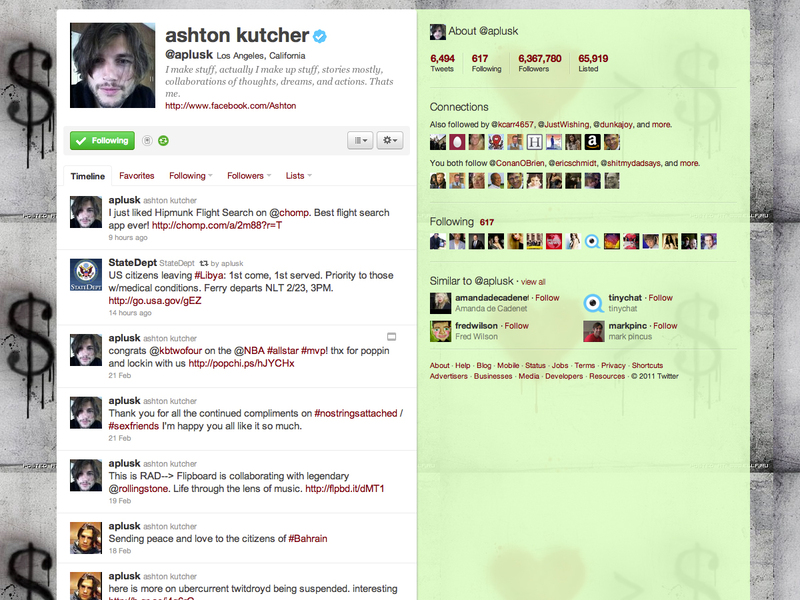 Number one just happens to be Ashton Kutcher. Below the list of power users is a link to the full directly of users who have added their Twitter profile TwtRoulette. Alternatively, you can just click here. If you have someone in mind, search for them in the search box. This function could prove valuable in the future, but as is, with only a couple hundred users, it’s best to just browse the list. You can also choose a random user to check out. To become a Twitter spy, just choose your target. In this case, we’ll go with aplusk (Kutcher). If you happen to like the list of followed tweets and want others to see it, then you can easily share it via the link at the top. If you want to join in on all the fun and let people see what you see in your Twitter timeline, just add yourself to the directory! 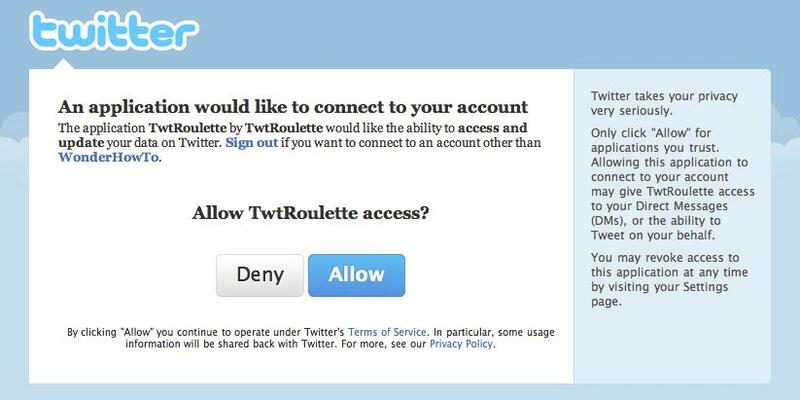 You must be logged into to your Twitter account and allow access to the application TwtRoulette. For the most part, this is an entertaining way to step into the shoes of others on Twitter. Browsing their timelines will provide hours of joy (and potential eye aches). Via How To Spy on Tweeters: Viewing Someone Else’s Twitter Timeline with TwtRoulette on WonderHowTo.